Exhibits : Egyptian Mummy, Buddhist stupa from Bharhut, Buddha's Ashes, Fossil Skeletons of Prehistoric animals, Art Collection, Rare Antiques, Collection of Meteorites etc. 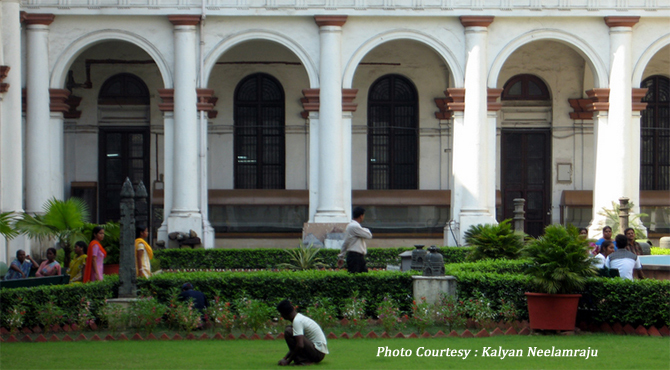 The Kolkata Indian Museum established long back in 1814 in the Asiatic Society Building was founded by Dr. Nathaniel Wallich, a botanist from Denmark. It is one of the earliest museums established in the world and considered the largest in the country. In 1875, it was shifted to the new building in Italian architectural style designed by Walter B Grawille. Opened to public in 1878, the museum has over 60 galleries under six main sectors of Art, Anthropology, Archaeology, Geology, Industry and Zoology. The museum with 3 floors is spread out over an area of 930 sq.mts. It is an independent institution funded by the Government of India. The Anthropology and Archaeology sections are located on the ground floor. There is also a library and publication unit, located next to the coin gallery, which has a vast collection of around 50 thousand books and journals on various subjects. Anthropological Section displays several objects like the costumes, ornaments, implements of the various tribes and gives an insight to the cultural life of both tribal and non-tribal people of India. There is also a gallery of rare musical instruments. Archaeological Section is the collection of stone-age artifacts from India and abroad, pre-historic antiquities from Mohenjodaro, Harappa etc. Some of the galleries in this section are Bharhut, Egyptian, Coins, Orissan Art, Gandhara etc. Bharhut gallery houses the railings and gateway of the Buddhist Stupa with carvings and sculptures depicting scenes from Buddha's life excavated from Bharhut in Madhya Pradesh in 1874 by Sir Alexander Cunningham. There is also an urn containing Buddha's ashes. Due to this the museum has become a place of pilgrimage. Gandhara gallery holds the best collection of Buddhist Sculptures from Gandhara region and other stone sculptures. The Egyptian gallery has a 4000 year old 'mummy', sculptures, paintings etc. The coin gallery has a collection of coins from the 5th century B.C. which displays gold coins issued by Kanishka, Samudragupta, Kumaragupta-1, Akbar and Jahangir. The Art Section spread on the 1st and 2nd floor has galleries of textiles, paintings, decorative art objects from China and Japan, specimens from Burma, Nepal, Tibet etc. The exhibits in the art section comprises Nepalese and Tibetan temple banners (Thankas), metal images, enamelled wares, bidriwares, ornaments, silver wares, glass wares, pottery, ivory and bone work, wooden sculptures etc. The painting gallery has a rich display of Mughal Miniature Paintings, Kangra-Kalam Paintings, Kalighat Patas from Bengal and a section of works of famous painters from Bengal. Along with the collection of Nepalese and Tibetan Thankas (scroll paintings done on cloth) dated from 15 to 19 century, the textile gallery has a display of Muslin and Jamdani from Dhaka, Persian Carpets, Phulkari work of Punjab, Kantha work from Bengal, rumal (handkerchiefs) from Chamba in Himachal Pradesh etc. The South East Asian gallery in the Art section has three separate galleries for artifacts from China-Japan, Burma and Nepal-Tibet. In China-Japan Art gallery there are coloured porcelains, wine cups, ivory and rhinoceros horn carved articles, paintings etc. Burmese gallery displays brass and bronze figures, wood carvings, silverwares and lacquer ware objects depicting 'Jatakas', scenes from the epic 'Ramayana' etc. Nepal-Tibet gallery houses bronze figures and wood carvings from 9th to 19th century, apron made of human bones, butter-lamp, ornaments etc. The extensive Geological Section has over 80,000 specimens, displayed in four galleries showing varieties of meteorites, precious stones, ornamental building stones, rocks and minerals and fossils. The sections dealing with fossil and taxidermy are notable. There are a number of unique fossil skeletons of prehistoric animals and an enormous dinosaur skeleton. Among them the most interesting are a giant crocodile and an amazingly big tortoise. Zoological Section, is rich with innumerable specimens of insects, fish, reptiles, mammals, stuffed birds and skeleton of mammoth. Industrial Section has several thousand botanical specimens bearing upon medicine, forestry, agriculture and cottage-industry. In a nut shell, the museum in Kolkata reveals the life and culture of Indians from the hoary antiquity till date. The museum is open to the public every day except Mondays and recognized holidays. The working hour is from 10.00 am to 5 pm. From December to February the museum will close half an hour earlier. Photography is not allowed without prior written permission from the authorities. Entry fee to the museum : for Indians Rs.10 and for Foreigners Rs.150/-.